Kansas became a state January 29, 1861, the 34th state admitted to the Union. Colonel Cyrus K Holliday wanted to build a railroad. In 1854 he picked out a spot and formed a town company. 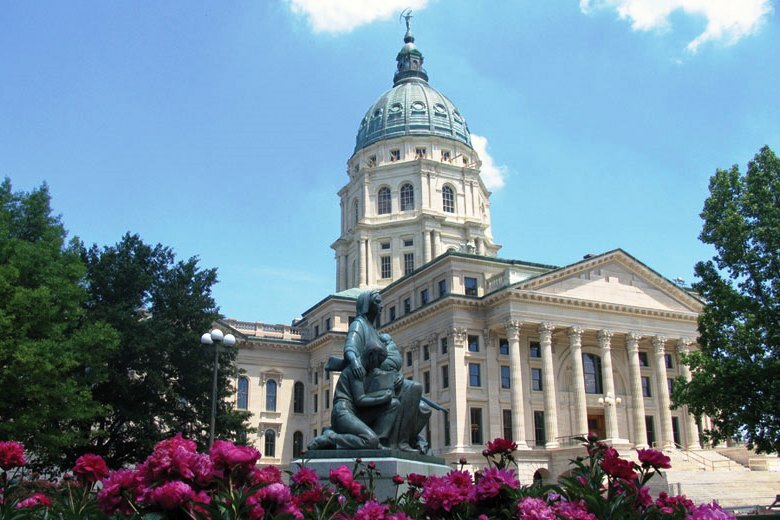 When Kansas became a state, his railroad town of Topeka became the capital. Col Holliday’s railroad was the Atchison Topeka and Santa Fe; its offices and machine shops are still important to the city. The French Renaissance State Capitol is designed to resemble the US Capitol. It is capped with a copper dome and cupola and is 304 feet tall. On the grounds is a statue of the Pioneer Woman by sculptor Merrell Gage. Here are the Combat Air Museum, with military aircraft from 1917-1980; the Museum of History with displays relating to the plains; and the Library of Kansas, housing one of the largest newspaper collections in the nation. Potwin Place, begun in 1869, is a community of stately homes and circular parks with walking and driving tours. The tall grasses flowing in the prairie wind; the brick-paved streets in the historic Potwin Place neighborhood; Old Prairie Town; being able to sit in the governor’s chair and tour the governor’s mansion; the warmth of friends. Mountains near: Flint Hills. Mount Sunflower on the western border of the state is the highest point in Kansas at 4,039 feet.